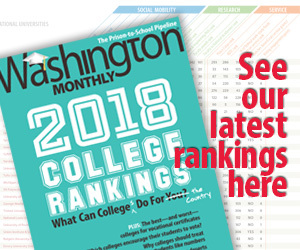 Washington Monthly | What Kind of Economics? Republican Dave Spence, the St. Louis businessman now running for governor of Missouri, appeared to have a rather conventional resume. This was not true. In fact, as the St. Louis Post-Dispatch reported, Spence was enrolled in a different school at Mizzou and in 1980 earned a bachelor of science degree in home economics. Yea, but I bet he can iron tablecloths like a dream.